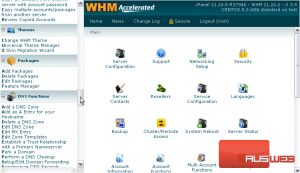 cPanel is x3, while the standard theme in WHM is x. All other themes included with cPanel have been deprecated, and cPanel recommends you don’t use them. You should find that x3 provides the most functionality out of all the available choices, anyway. You’ll see in the tutorial directly after this one how to adjust the way a theme looks with the Branding Editor, with a particular focus on the x3 theme. Be sure to check it out, if that interests you. Now, let’s see how to manage themes in WHM. 1) Under the Themes category, go to the Universal Theme Manager. Here, you can manage themes for cPanel, its login page, webmail, and WHM. All of these sections are very similar, so we’ll just be going over one in this tutorial. 2) Under cPanel, click Manage Themes. This is the cPanel Theme Manager. Here, you can see a list of all the themes currently installed for cPanel and perform several actions on each. We should note right away that the x3mail theme is intended for servers that will only function as a mail server. This theme is not for accounts that will host websites. Down here, you can install a cPanel Theme using a .cptheme file. You can also manage addon themes, but there isn’t much of a selection. You can download or delete a theme using these buttons. Or, view a preview image of a theme by clicking the magnifying glass next to its name. 3) To create a new theme based off of an existing one, use the Clone tool. 4) Click the Select link next to a theme. 5) Enter a name for the new theme, then press Submit. The theme has now been cloned to a new one. 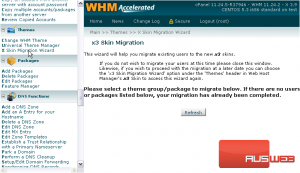 6) Now, let’s take a quick look at the X Skin Migration Wizard. If any users or packages on your system are using a theme other than the new x3, they will be listed here. You’ll be able to migrate them all to the new theme using this tool. This completes the tutorial. You now know how to manage Themes in WHM.